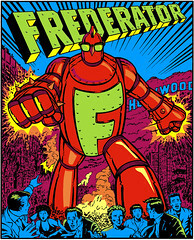 The Frederator Studios Blog: Oh Yeah! Mikhail Shindel, Slava Ushakov, Glenn Buswell. Oh Yeah! Mikhail Shindel, Slava Ushakov, Glenn Buswell. Mikhail, Slava, and Glenn were nice enough to come and show us Shapito for consideration in the fourth season of Oh Yeah! Cartoons. Mikhail Shindel founded Kinofilm in Los Angeles in 1996. The new company quickly landed a deal to produce Mike, Lu, and Og on the Cartoon Network. Since 1998, Slava Ushakov has been based at Kinofilm in Los Angeles, where he works as a director and storyboard artist. Glenn Buswell started working at Kinofilm in 1997. He moved to development where he, Slava, and Misha continue to create projects from animated series to features. Currently he is the Production Coordinator on Nickelodeon's Catscratch which bows July 9th at 8:00 pm. Thanks to Mikhail, Slava, and Glenn for kind permission to show a storyboard frame from Shapito.